Comments: The cemetery at Christ Church, Glendower, is located about 4 miles northwest of Scottsville. 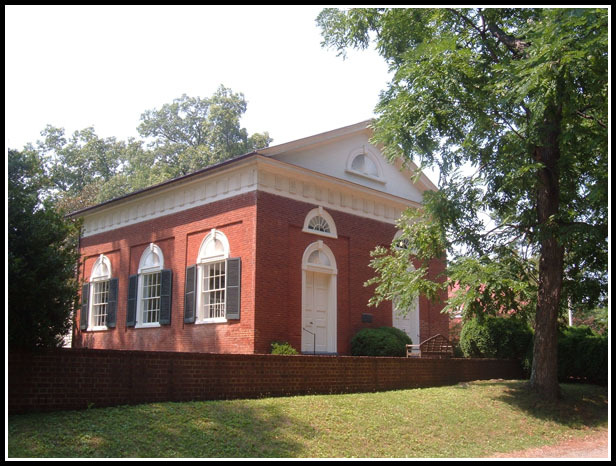 Construction of Christ Church began in 1831, and Bishop William Meade of Virginia consecrated the church on July 28, 1832. As of July 2017, the Christ Church Cemetery contained approximately 224 gravestones. Directions to Christ Church from the Scottsville Museum: Head West on Main Street and take a right onto Valley Street. Travel North on State Route 20 approximately 4.5 miles. Turn right at the Episcopal Church sign on Glendower Road, SR713, and travel one mile. Christ Church is on the left hand side of the road. The cemetery is located behind the church. Following is a July 2006 listing of the extant gravestones at Christ Church Episcopal Cemetery as prepared by Gretchen Calcagni, an intern at Scottsville Museum from the Institute for Public History at the University of Virginia. In July 2017, this listing was updated by the addition of gravestone photos, provided by Connie Geary, which resulted from burials at Christ Church between July 2006-July 2017. The resulting listing includes those individuals, who are not yet buried in the cemetery, but whose names appear on gravestones there. Women are listed by their married names. Also, asterisks (*) that appear before names denote veterans. Died January 14, 1914, aged 57 yrs. Note: Death date is buried in soil at grave site. Moon, Cary Nelson Jr. M.D. Wife of Col. William H. Sage, Jr.
*Sage, Col. William H., Jr. The gravestone listing of Christ Church Episcopal Cemetery, Glendower, was compiled by Gretchen Calcagni in July 2006 with updates by Connie Geary in July 2017 as part of Scottsville Museum's ongoing effort to record local church and cemetery records.